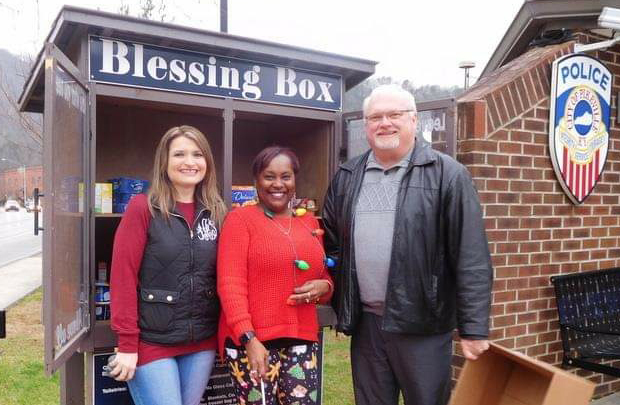 Kentucky Power employees deliver food to the Blessing Box in Pikeville, Act of Appreciation No. 4 of 100 planned for our 100th anniversary. ASHLAND, Ky. – On July 21, 1919, just weeks after the U.S. Congress approved the 19th Amendment guaranteeing women the right to vote, a new company was formed in eastern Kentucky. That company – Kentucky and West Virginia Power – grew to become Kentucky Power. For nearly 100 years, Kentucky Power’s mission has been to provide residents and businesses in eastern Kentucky with safe, reliable and affordable electricity. In celebration of Kentucky Power’s centennial this year, that mission continues with a focus on customers and giving back in the communities where employees live and work. The 100 Acts of Appreciation Campaign kicked off January 2 and runs throughout 2019. Already, during the first two weeks of 2019, employees have participated in four Acts of Appreciation. One of the first acts came in the form of a warm coat for those in need. Employees in Ashland, Hazard and Pikeville employees collected more than 150 mostly new coats and delivered them to local churches and shelters. Employees also provided food to help stock the Blessing Box at the Pikeville Police Department. In addition, Kentucky Power is continuing to support businesses through the Kentucky Power Economic Development Growth Grants (K-PEGG). The eKentucky Advanced Manufacturing Institute (eKAMI) has received $125,000 to fund the development of an apprenticeship program. Last year, eKAMI opened it HAAS training center in Paintsville with a goal to retrain the region’s exceptionally skilled workforce for new careers in the Advanced Manufacturing. Kentucky Power, with headquarters in Ashland, provides service to about 168,000 customers in all or part of 20 eastern Kentucky counties, including Boyd, Breathitt, Carter, Clay, Elliott, Floyd, Greenup, Johnson, Knott, Lawrence, Leslie, Letcher, Lewis, Magoffin, Martin, Morgan, Owsley, Perry, Pike and Rowan. Kentucky Power is an operating company in the American Electric Power system, one of the largest electric utilities in the United States.